The Rio Aliso apartments are located at the entrance of the town of Llonín in Peñamellera Alta (East of Asturias), outside the urban core. They come from the rehabilitation of an old house located in the environment known as Aliso River. 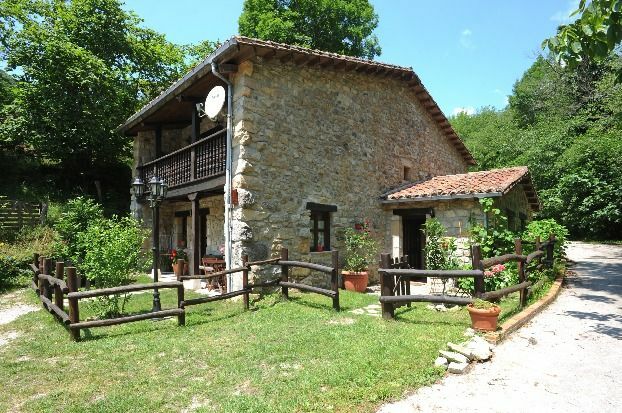 It consists of 2 independent apartments with 4-6 beds each, built in stone and wood according to the traditional typology of this area of ​​Asturias. Both are fully furnished and equipped with ceramic hob, oven, microwave, washing machine, dishwasher, DVD, stereo and all the kitchenware and lingerie needed to spend a few days comfortable in nature. They have gas-oil heating. They are ideal for the practice of salmon, trout and trout fishing in the waters of the Cares River in Asturias. Hosted fishermen can enjoy free of charge a guided tour of the river to know the best areas, preserves, free, wells, etc. Likewise, advice is given in the choice of preserves, dates and fishing licenses are processed. For stays longer than 5 days we make an ornithological visit free of charge for the environment between several itineraries to choose from. - APARTMENT 1: It has a capacity for 4-6 people, with the following distribution: - Ground Floor: Kitchen-dining room equipped with ceramic hob, extractor hood, microwave oven, washing machine, refrigerator and all kinds of household items. The living room is equipped with a complete furniture, television, music system and sofa-bed. - Upper Floor: Corridor with chestnut balcony of traditional style, six meters long and facing south. Fully equipped bathroom and two bedrooms, one with a double bed and the other with two single beds. - APARTMENT 2: - As the first has a capacity for 4-6 people with the following distribution. - Ground Floor: It has the same characteristics as Apartment 1 except that in this there is a bedroom equipped with two single beds. - Upper Floor: Fully equipped bathroom, bedroom with double bed and built-in wardrobe.